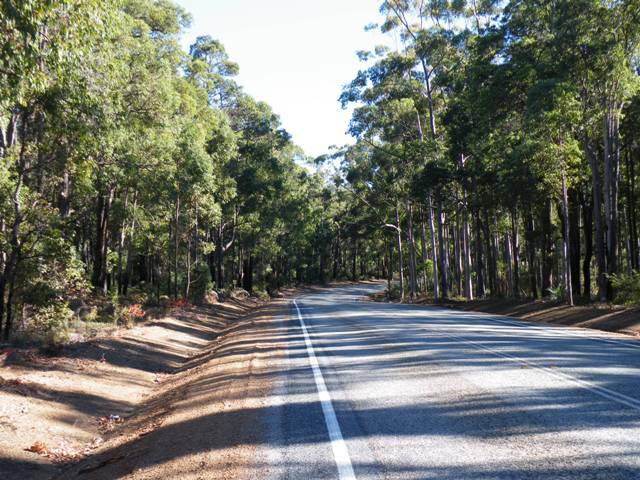 Travelling up to Perth from the South West always feels like an escape. I probably shouldn’t say this because you’ll think that I never get out, but it’s always a little bit exciting, and somehow filled with possibility, as if anything could happen and new places may be discovered. From the forests of the South West to the excitement of the city and Perth where there are lots of fun things to do at night. I can’t wait for the evenings when He Himself and I put on our comfy shoes and walk, with rarely a table booking, taking the city by chance and waiting for serendipity to strike. Expect the MOST AMAZING sunsets if you walk along Riverside Drive at dusk. Walk from the river up the hill, along Barrack Street and into Northbridge. Perhaps you’ll enjoy Jamie’s (Jamie Oliver’s Italian restaurant ) on William Street, or maybe you’ll head to Yagan Square for the night lights, and an array of eateries. 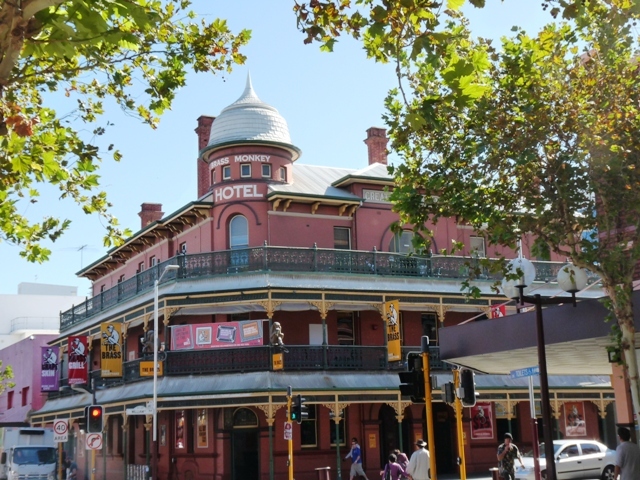 Northbridge has so many diverse places to eat, that you’ll be spoilt for choice. And how about The Ellington night club, for some jazz. I love the Ellington. It’s all New York style on Gloucester Street, with a dim black interior, and dark corners. The little window, behind which the receptionist sits, as you enter a small foyer cubicle with two heavy doors makes you think you’re arriving somewhere dark and private – where my writer’s imagination believes just for a moment that I could belong to the Maffia or something of equal disrepute as I’m ushered through the second door into a cosy, intimate venue where music is live and conversation is hushed. It’s a great way to end the evening. After a bottle of wine, a couple of Tapas, and enough jazz to fill your brain until the next time, it’s time to go. 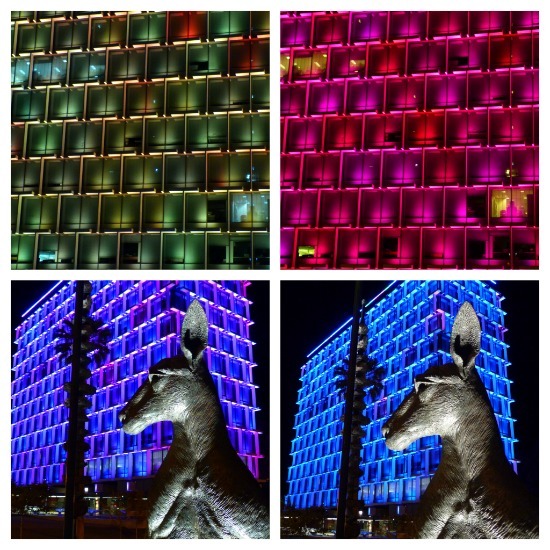 Walk past the council buildings at night – they’re amazing and change colour! Spot a kangaroo or two, too! And head to a wonderful hotel for the night … Tip: Prices are generally cheaper during weekdays. 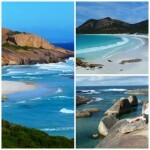 Check out Booking.com for the best prices on available hotels in Perth. Then it’s generally Shanks Pony (walking) for us. All the way back to our hotel through Perth’s city streets enjoying a walm balmy night, watching the lights. Walk up to King’s Park and watch the sun set over the city as the city skyscrapers light up. Have a meal in the revolving restaurant “C” on Level 33 of St Martin’s Tower. The nighttime views are spectacular. 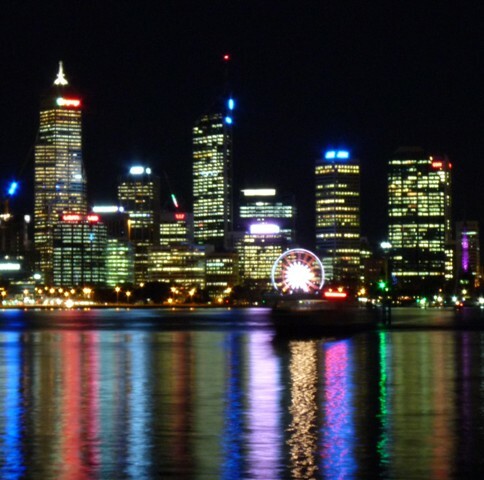 Take the ferry to South Perth and look back across the river at the city lights – spectacular view. Take a ferry to Claisebrook Cove and enjoy a meal overlooking the canal. Enjoy Elizabeth Quay, walk across the pedestrian bridge, eat seafood, have a sundowner overlooking the water. I’m already looking forward to the prospect of my next visit to not so sleepy Perth. How about you? Where do you like to go or what do you like to do for a night out? What to do when your site gets Hacked. The horrible truth about malware. Where’s the best place in the world to live? Dare I say this? Ha Ha, yes that is true. The big smoke or the country – ahh, the human condition, never content – and we cannot ever have it all! Yes, Perth has it all for a city getaway. We have just come back from seeing the “Picturing New York” exhibition. Who needs a BIG city? – I think Perth has everything we could want! Glad you enjoyed Picturing New York. Yes, the fact that Perth isn’t too big is a plus by my books too. Ha Ha, Red! Adult content indeed! I want to go to Perth now! It sounds like you had a great time Jo. I have always wanted to visit Aus, but it is a long way from the UK. Hopefully I will get round to it some day. Yes, it’s a long way from the UK, Jon – but Perth is actually the closest place in Aus to fly to. Hope you make it over one day – it’s such a great country wherever you choose to visit. These are all great suggestions for a wonderful night out. I don’t know too much about Perth but I would love to watch the sunset over the city and then dine at that revolving restaurant. Glad to hear you had an enjoyable night. Love the Council House changing colors. Thanks for your comments, Mary. 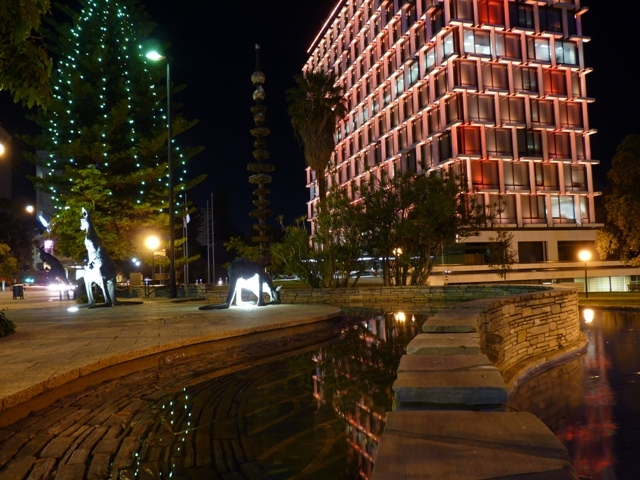 Yes, perth is a lovely city at night – and the Council House is always a ‘rubber neck’ spot! Pingback: Things To Do In Perth With Kids - Adventure, baby!